NOTE: This post is mostly about the cameras and gadgetry in use at the Wheel of Fortune taping. If you'd like to read about the whole experience (there's more to tell then you'd think), head over to RyanAndShelsy.com. Anyway, the weather ended up cooperating quite nicely last night and Wheel of Fortune wasn't canceled. After making our way through the line and into the outdoor stadium where it was being filmed, one of the employees in charge of seating people asked us how many were in our party. He then asked us to follow him and led us to slightly elevated seats dead center in the stadium. Probably the best seats in the house. We were in a small, elevated section with about 15 seats. We were told that these seats were some of the most camera prominent audience seats. Very cool. Almost immediately, I began to take stock of the equipment in use at the taping. It was incredibly extensive...and expensive. If I had to guess, I would say there was over half a million dollars worth of lights alone. The area above the stage was jam-packed with lights. There were stationary lights as well as several dozen movers. And that's only the lights above the stage. There were almost as many spread out around the stage, lighting up the water behind, the audience, etc. Then there were the cameras. They had two crane cameras, one on either side of the stage, and a third crane on the balcony shooting down onto the stage. And these were super expensive cranes, complete with robotic control of the camera head, dual screens for the operator and incredibly fluid movement. I counted at least five mobile cameras, three on wheeled tripods and two on steadycam rigs. All five of these, as well as the three crane cameras, were all broadcast quality, Sony HD cameras. Very expensive, indeed. Finally, there were three massive Sony cameras with Digi Super 86 lenses for serious zooming. These three were anchored down and fixed on various parts of the stage. One was on the contestants, one on the puzzle board, and one on center stage. 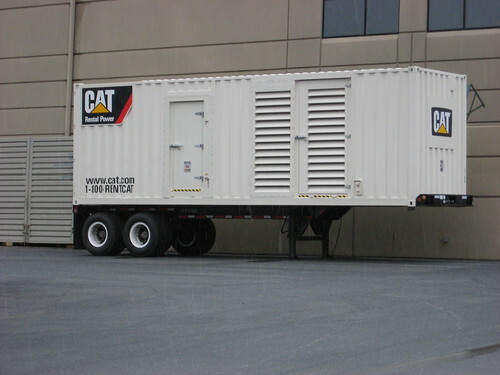 Oh yeah, and all or most of this was being powered by two seriously ginormous Caterpillar generators behind the stadium. They were the size of single-wide trailers, I kid you not. So, yeah. You can see what an incredible array of equipment was in use at this filming. Easily several million dollars. And I'm not even counting the audio equipment because I didn't get a good look at any sound boards, microphones, etc. Anyway, we had a really fun evening at the taping and got to watch them film two full episodes of Wheel of Fortune. Don't forget to check out RyanAndShelsy.com for the full story without all the geeky details.